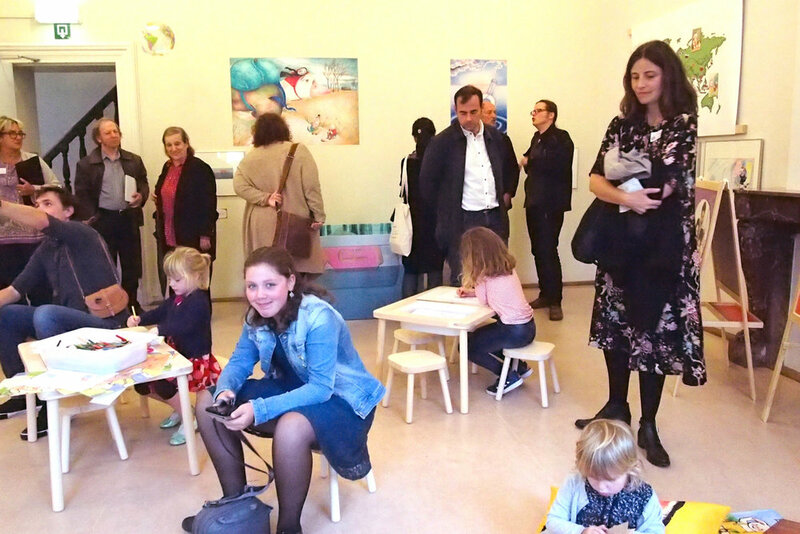 On 22 september was the opening of the Kleurboel exhibition, and the award ceremony of the KeyColours picturebook competition. I took part in the KeyColours competition with my picturebook Helme’s Grote Hoofd (Helmes Giant Head), along with 422 other illustrators all over the world, who submitted their picturebook. To my big surprise, my work did not only make it to the longlist of 44 illustrators, but it also made it to the shortlist of 6! This meant that my work would be included in the Kleurboel exhibition in the Stadsmus in Hasselt, and that I was one of the six finalists that could win a cash prize and publication by Clavis Uitgeverij. The opening of the exhibition was on 22 september in the Stadsmus museum in Hasselt (Belgium), and the award ceremony took place a couple of hours later in the offices of Clavis Uitgeverij on the beautiful Herkenrode Abbey site. It was a great day on which I met a lot of nice and interesting people, and saw a lot of great illustrations. And then it was time to get a bit nervous for the award ceremony… Of course the publisher and the alderman of culture of the city of Hasselt kept the tension until the last minute. After the winner of the award: Eva Schirdewahn from Germany was announced, they also announced that Clavis Uitgeverij will also publish the other finalists, which was the first time in the history of the KeyColours award that they decided to do that. So I am over the moon that my book will be published! If you want to visit the Kleurboel exhibition: you can still go visit the Stadsmus in Hasselt until 4 november. Do pop in if you are in the neighbourhood!